We’re taking a closer look at three interesting desert plants. But don’t get too close; they may prick you! Deserts are extreme environments. They can be hot or cold, but they all receive under 10 inches (25 cm) of precipitation each year. To put that in perspective, New York City and Hartford, CT receive an average of around 45 inches, while Hilo, HI receives over 120 inches ! Despite harsh dry conditions, deserts have surprisingly high biodiversity  and are home to many plants and animals that are well suited to their desert environment. 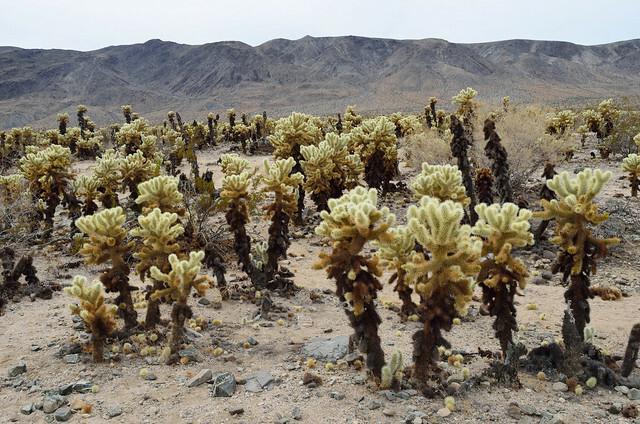 On a recent trip to the Mojave and Sonoran deserts, two hot deserts in the Southwestern U.S., the following spiny plants made a lasting impression. You could even say they…stuck with me. The pancake prickly pear is a cactus that grows in both the Sonoran and Mojave deserts. It can grow up to 2 meters tall and has long spines that cover each cactus pad. The spines of the pancake prickly pear, like most cacti, are modified leaves. This modification minimizes the surface area of the plant, to reduce potential water loss through transpiration. The spines also protect the plant from predators. The teddy bear cholla is native to the Sonoran desert, and can grow up to two meters in height. As it grows, the lower stems get dark and fall off, giving the base of the cactus a burned dead look. The teddy bear cholla gets its name from the numerous spines that cover the plants many stems. From a distance these spines look soft and fuzzy, like a teddy bear. Don’t let that fool you though, they are plenty sharp! The ocotillo is native to the Sonoran and Chihuahan deserts. It is a large shrub, growing up to 20 feet tall. Like cacti, this shrub has long sharp spines along the stems. However, ocotillo are unrelated to cacti. 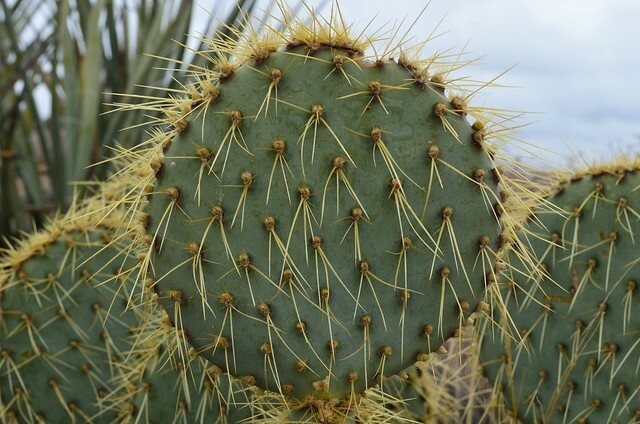 Cacti are grouped in the family Cactaceae which consists of over 100 species while ocotillo is in the family Fouquieriaceae, which only consists of 11 species! The ocotillo is a “drought deciduous species” meaning that it grows leaves after a rainfall event, and then loses those leaves as conditions become drier. 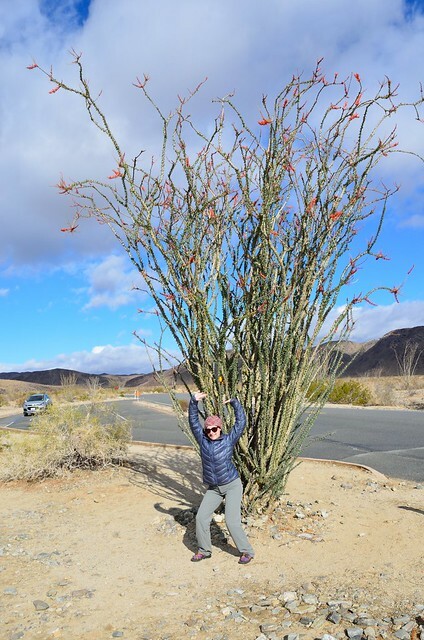 After it rains, the ocotillo produces small leaves and along its stems as well as red flowers at the ends of the stems. The plant may produce leaves and flowers upwards of five times in one year. Durant, S. M., Pettorelli, N., Bashir, S., Woodroffe, R., Wacher, T., De Ornellas, P., … & Beddiaf, M. Forgotten biodiversity in desert ecosystems. Science (2012), 336: 1379-1380.